All the colors of your campaign (background, foreground, borders, footer, and buttons) are a part of a style. You can easily change these colors in your account. Warning: These changes will be applied to any campaign that is using this style. You can create a new, custom style if you don't want other campaigns to have the style changes you're making. On the Campaigns page, click Compose to create a new campaign, or click Edit under an existing campaign. The style that you're currently using is highlighted in gray. 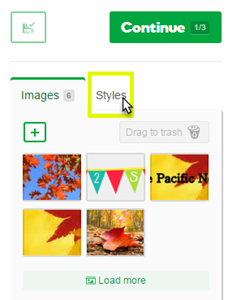 Click the pencil button beside the current style to edit it. 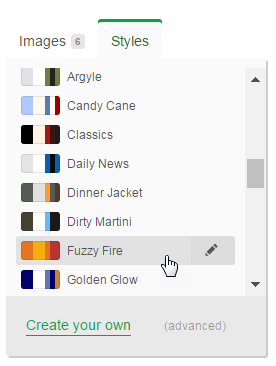 On the Main tab, click the color boxes beside each item in the style box and choose new colors, then give it a new Name. If you know the hex code of the color you want to use, enter the values inside the hex code fields (example: #E47621) to the left of the color boxes. • The Background is the color behind the main content area. • The Foreground is the color outside the main content area. 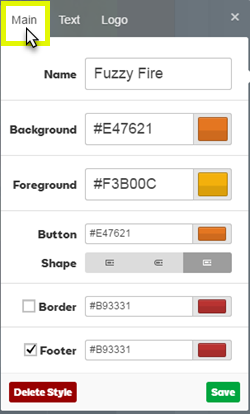 • You can turn on and off the Border and Footer colors by checking the boxes to the left of the those items.